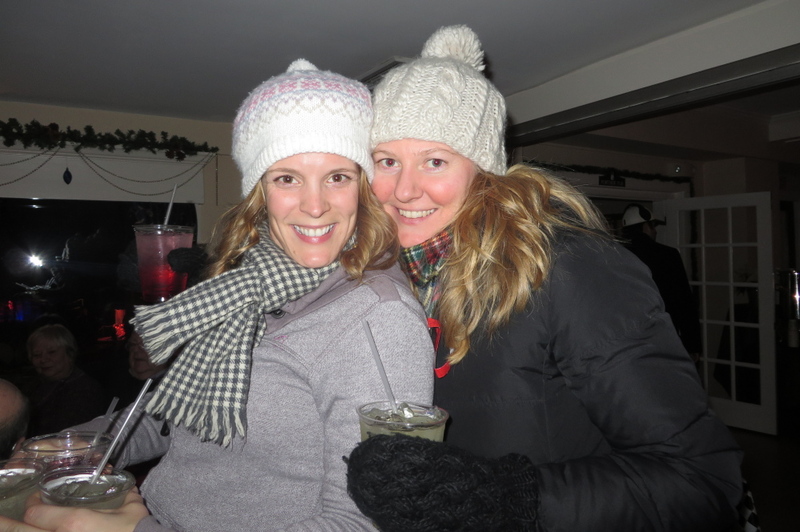 Kennebunkport party has something for everybody – from the bonfire to Boffa. Fire & Ice lures hundreds of revelers out on a cold – but heartwarmingly festive – evening. Kennebunkport is proud of being HGTV’s No. 2 Christmas Town. The 10-day Christmas Prelude festival is a large part of what makes Kennebunkport special this time of year. And Prelude culminates with the annual Fire & Ice Bar at Nonantum Resort. Tallulah Thompson and Kara MacDonald of Portland pick up some cocktails for friends. Krissy Fullerton and Jay Armstrong of Saco warm up indoors. 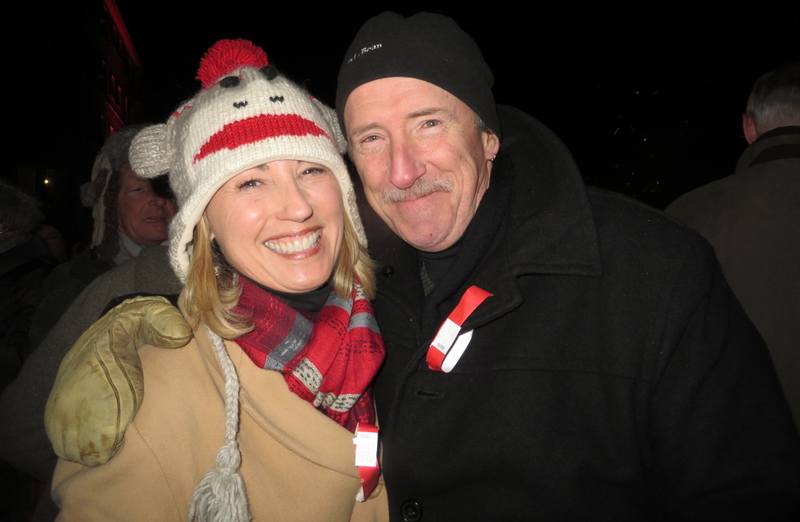 Teri Collard and Paul Coughlin of Kennebunkport enjoy the bonfire. 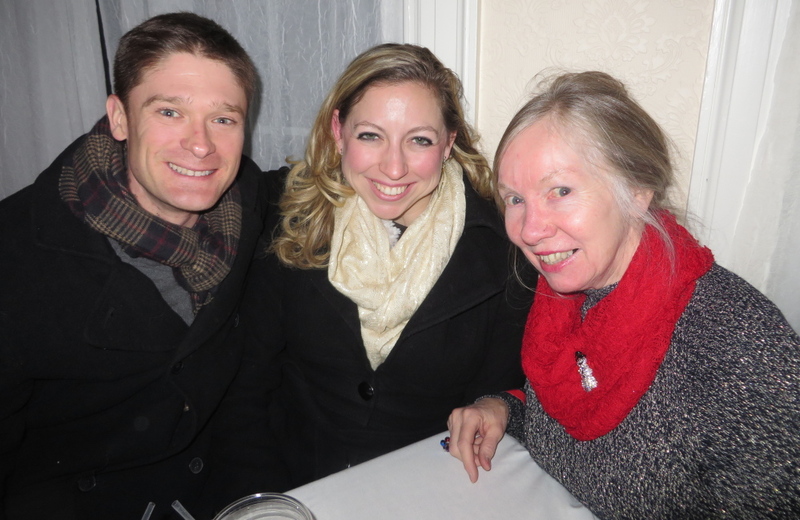 Newly engaged couple Preston Hieb and Elle Litwinetz of Boston with Elle’s mother, Mary Litwinetz of Saco. About 2,300 people celebrated the season at Fire & Ice last weekend, with a portion of proceeds going to children’s charities. 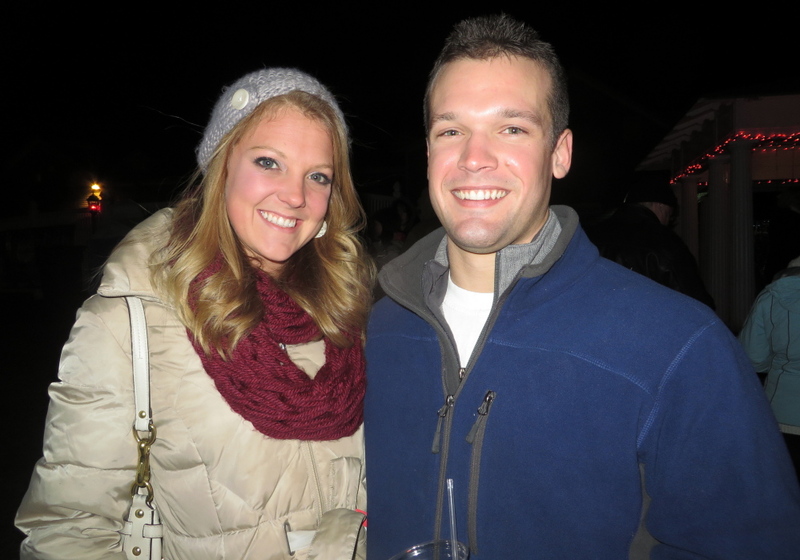 The town was bustling Friday night – with a tree lighting, fireworks and 800 people at the five-hour indoor-outdoor party that is Fire & Ice. There was something for everybody, from a live band in the ballroom to the giant bonfire by the waterfront. Guests in Adirondack chairs circled a dozen smaller fires. Partygoers could be photographed sitting on an ice sculpture of a lobster. Or drink a martini poured through an ice luge. Or sample comfort food from more than a dozen local vendors, including Federal Jack’s, Flatbread Company, and Bradbury Bros. Market. Partake in a pig roast. Or indulge in signature cocktails with names like It’s a Wonderful Life and The Nutcracker. “It’s one of the most fun events we’ve been to,” said John Kostrisak of Dedham, Mass. “It’s like karaoke every night,” said one of the band’s singers, Annelyse Atkinson of Windham. “We love sitting outside in the cold next to the flames,” said Juliette Bravo of Kennebunkport, a third-timer at Fire & Ice. Bethany Ouellette of Scarborough jumped on the lobster ice sculpture by Ed Jarrett and let her parents and boyfriend’s parents take photos. “He’s at home with a cold, but I’m having a good time,” she said. “This is something I’ve been wanting to do,” said Hannah Taylor of Portland, roasting marshmallows with Nick Smith, also of Portland. “We came last year and absolutely loved it and had to come back,” said Allison Smyth of Wells. Working for Kennebunk Light and Power, Adam Curtis of Waterboro helped decorate the towering tree in Dock Square. He was so impressed with Kennebunkport at Christmas, he brought his wife and a few friends to Fire & Ice, where they had no difficulty finding an available fire circle. Visitors traveled a lot farther than Waterboro – even from Canada. Many of the partygoers, including Alison Geering of Hartford, Conn., took notice of Fire & Ice while in Kennebunkport during the summer. 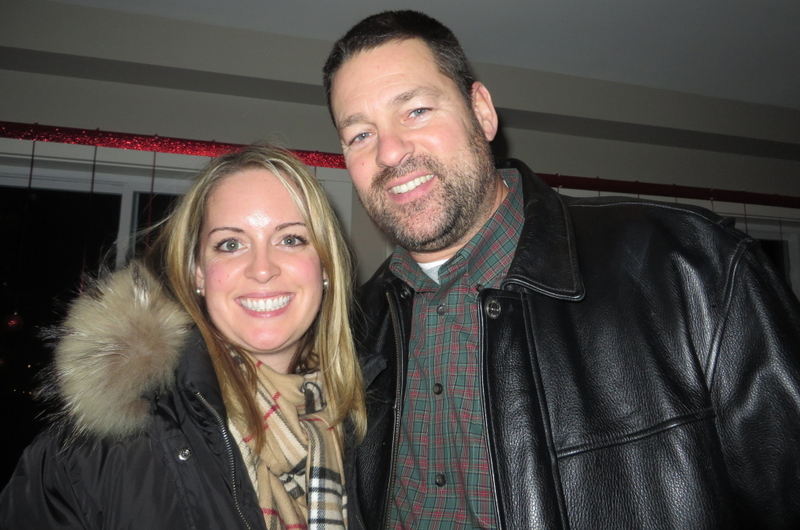 “We’re on a mini-honeymoon runaway weekend,” said Jaime Cherrier of Plattsburg, N.Y., with her husband, Dave. “We wanted to come do something different while our kids are away for the weekend for a swim meet,” said Scott Niness of Sutton, Mass. He and his wife, Pat, staked out a couple of leather chairs in front of the fireplace and enjoyed people watching. “There’s usually twice as many people on Saturday night,” said Nonantum chef Tony Arabia of Lyman. In fact, as the season’s first big snowstorm moved in Saturday night, Fire & Ice capped out at full attendance of 1,500 people. How does such a large crowd park in downtown Kennebunkport? With complementary heated trolley service to a number of lots. An added bonus: Seeing the town’s distinctively old-fashioned light displays on the way back to the car. After a few years of giving a portion of proceeds to Winter Kids, Fire & Ice solicited proposals from potential recipients. Friday night raised money for Education Foundation of the Kennebunks to help fund extras such as field trips. Saturday night benefitted Make-a-Wish, which grants wishes to critically ill children.